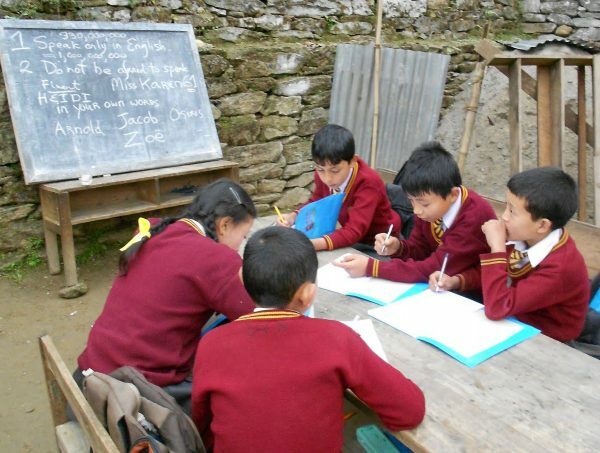 By becoming a HELP volunteer teacher in India or Nepal you will be able to make a direct, personal contribution to the education of young Himalayan people. In so doing, you will be having an unforgettable experience in a new and fascinating world. I didn’t really appreciate how great HELP was until I got the chance to talk to some other teachers in Kalimpong. I met at least four or five others who were teaching and all of them seemed to say their placements were unorganized and boring. Some also paid as much as 6 times the amount I paid and they didn’t know where any of the money went. HELP gave me the opportunity to work very independently with the comfort of having a number of reliable contacts in and out of my placement. I can’t say enough how glad I am to have chosen this organization over some of the other available opportunities. (I)…had the most fascinating time in my life teaching the loveliest kids on earth! HELP is looking for mature people willing to give up some of their time to do something positive for the children of the Indian and Nepalese Himalayas. In the process of contributing to their educational needs, you are likely to find that your own need for self-development is met. Most of our volunteers have an amazing, life-enhancing experience. It is important to understand that HELP is not engaged in the ‘voluntourism’ business. HELP is a non-profit organisation. Our volunteers are not tourists while they are with us. We take up references and we ask for usable skills. What’s more, we expect them to give us at least two months of their time. The greatest need is for teachers of English as a foreign language (TEFL). If you don’t have any experience in this field, don’t worry. We can point you in the direction of a basic TEFL course, and we will supply you with a starter pack of TEFL materials that will help you get through the first couple of weeks.. In addition to teachers, we are looking for doctors and dentists for a clinic in the western region of Nepal. In addition to your idealism and skills, the qualities you will need to make a useful contribution to your school are: resilience and adaptability, an open mind and an interest in other cultures, good mental and physical health, and tact and diplomacy. working people taking a career break. retired people who are not yet ready to put their feet up! graduates wanting to have an ethical adventure before starting their careers. students aged at least 19. If you are still reading this, and feel you have what it takes, please read on! Volunteer teachers must be able to commit themselves to an attachment of 8 weeks (an exception can be made for practising teachers who are fitting their volunteering into their summer vacation). Medical volunteers are accepted for two or three week assignments. HELP is not government funded and so we must ask you to help us defray our costs in return for your placement and make a contribution to our schools’ support programme. Our fees range from £330 to £480 (depending on your status) which is payable to HELP in British pounds. In addition, you will need to pay your local hosts a modest amount for your board and accommodation in local currency. A one-off fee payable to HELP to cover your placement, pre-departure briefing materials and advice, as well as the services of a local HELP representative and our administration expenses. Receipt of this fee secures your placement. A one-off donation to further HELP‘s work in supporting schools and children. (We ask you to present £70 of this money directly to your school). Please note that no-one is exempt from the payment of the above-mentioned fees, and there are no paid positions in HELP. We are all unpaid volunteers. You will be able to take part of your donation to your school. The rest goes into HELP‘s donations fund. For information about how this fund is used, visit our donations page. After we receive your on-line application (see below), we will make an initial assessment, and then in most cases we will Skype you so that we can find out more about each other, and decide together whether volunteering with HELP will be in your best interests, and in the interests of the Himalayan community. If both you and we decide to proceed with your application, we will then contact two referees nominated by you. One should be a past employer, while the other should be someone who knows you well in a personal capacity (not a member of your family). Provided we receive two positive references, we will make you an offer. As soon as you have signed up, we will send you briefing materials, and connect you with past volunteers where appropriate. Select the region you are interested in volunteering in, and send us the completed application form.